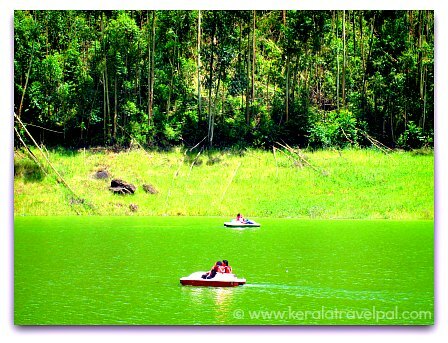 Eco point is a lake side location about half an hour drive from Munnar. It is on Top Station road, about 6 kms past Mattuppetty. The artificial lake is the same reservoir that is at Mattuppetty and the view is similar as well. The drive from Mattuppetty to Top Station is scenic. There are some areas where elephants reach near the lake to drink water. Seeing elephants near the road is unusual, especially during day time. However, such a chance cannot be totally ruled out as well. Boating is popular at Eco point. The other thing to do is just to enjoy the scenery and take a few snaps. Or some small shopping at the make shift stalls which sell small souvenirs. There is only a small area where people can stand and a part of it is taken by stalls. All the visitors gather close by. So you may feel it is crowded. Need to be careful while walking on the hard uneven surface and the blunt edges. Also the slope at the entrance is challenging for the elderly and small kids. You may wonder why it is also called ‘echo point’. Is there any echo here? Well, the opinion is divided on that. While many people do not experience any echo, some attest that they have heard reverberations. Eco point is easy to reach from Munnar. Take the Top Station highway. 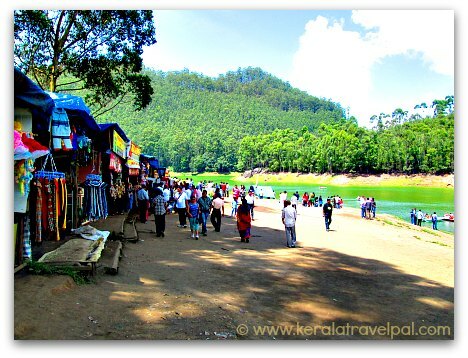 Mattuppetty, the first major tourist spot on this road, is about 12 kms from Munnar. Travel another 6 kms and you will reach Eco point. The other tourist attractions along the same road are Kundala dam and tea gardens, Yallapatty tea estate and factory and Top Station. 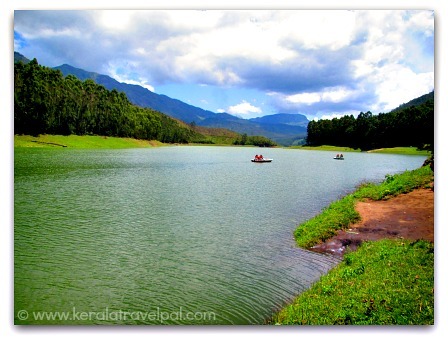 Nearest towns: Munnar at 18 kms. Bus Station: Munnar at 18 kms. Taxi Hire: Munnar Town at 18 kms. Railway Station: Eranakulam Railway Station at 141 kms, Aluva Railway Station at 126 kms. Air port: Cochin Int’l Airport (COK) at 126 kms. Nearby Attractions: Carmalagiri elephant walk, Mattuppetty dam, Kundala dam, Yallapatty tea estate and factory, Top Station, Chinnar Wildlide Sanctuary, Marayoor, Manavan Shola, Periyar Tiger Reserve, Kumali, Munnar town, Devikulam, Peerumedu, Eravikulam National Park, the Arch dam, Idukki wildlife sanctuary, Anamudi, Waterfalls of Cheeyappara, Valara, Thommankuthu, Keezharkuthu, Attukal and Chellarkovil, Anachal, Malankara reservoir, Mangala Devi Temple, Meenuli, and Kalvari Mount.